Berliner was originally tasked to reimagine the shared common areas of a creative engineering office in a building that has not been renovated since 1980’s. Through Town Hall meetings and spending an entire day with various user groups to better understand the client’s corporate culture, we saw that the building was deficient of many basic amenities such as break rooms with sinks and appliances, collaboration rooms, and shower facilities for employees who bike to work. After studying various other institutions of similar size and caliber, Berliner proposed options for amenities and relevant locations within the building that would best suit the user group’s needs. The initial effort for reimagination targeted three employee-centric areas: the Lounge, the Gallery, and a centrally located break room per each of the upper floors. 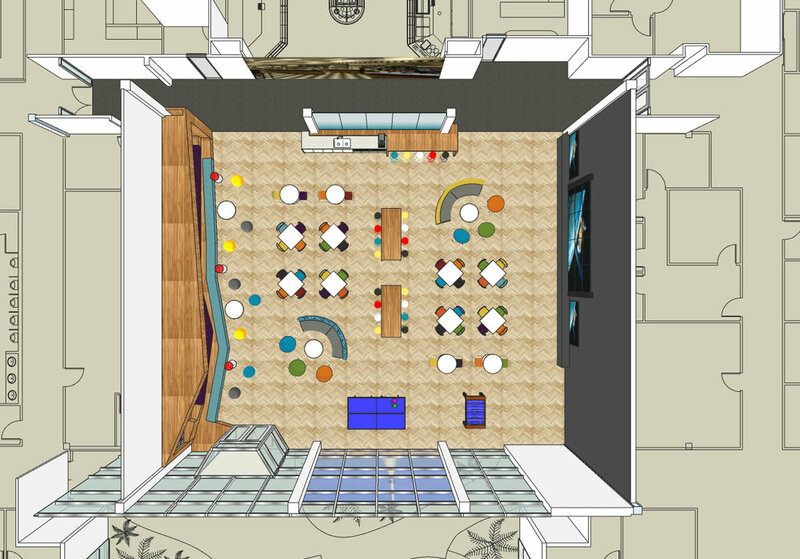 Floor plan for the Lounge. The existing cafeteria was re-branded as the Lounge to be a warm and inviting space like a local coffee shop. Berliner took advantage of the high volume of space above the existing ceiling by opening up the ceiling altogether and proposing three options for light and sound management with each option uniquely addressing the vertical volume of the space. Tiered seating along the entire length of the west wall provides supplemental seating for all-hands meetings that are attended by 300+ employees at a time. A built-in coffee bar features a decorative translucent panel that visually separates the Lounge from the kitchen and also acts as a acoustic barrier between the two spaces. The existing furniture, all recently procured, will be supplemented with additional pieces to add pops of color to add vibrancy and energy. The Gallery is an interior space that connects the two courtyards of the building, and at 12’-0” wide it was an awkward space that was underutilized as a circulation path. By borrowing 3’-0” of width from an adjacent office bay, the space was transformed into an informal collaboration area with a kitchenette. A wood portal is created to separate the space from the path of circulation and one of the newly defined primary branding colors dominates the space for a striking visual statement. Berliner proposed the break rooms to be situated centrally on 2nd and 3rd floors near the elevator bank and a commonly traveled stairwell to foster a sense of community within the company and capturing the exterior window line to allow natural light to come into the space. In order to open up an entire office bay from each floor that is already densely planned with private offices, the break room is designed with collaboration rooms within it to limit the impact elsewhere in the building. Three options that Berliner presented are all unique in its architectural solutions ranging from contemporary modern to industrial residential, but the use of same materials and features tie these spaces to the Lounge on the first floor. The collaboration rooms are designed for smaller private meetings while the larger span of the break room with all its amenities provide areas for informal collaboration.